In a two-sector economy consisting only of consumers and business, aggregate demand for goods and services equals the sum of consumers demand and business demands or the sum of personal consumption expenditures and private domestic investment expenditures. A change in aggregate demand may be initiated by a change in either consumptions expenditure or investment expenditures but it is more commonly the investment expenditures that appears to be the source of the changes in demand that set into motion sizeable movements in the income level. With changes in investment playing this strategic role, it follows that an explanation of changes that occur in income requires that we find an explanation for the frequent and sometimes drastic changes that take place in investment. Investment is the acquisition of capital assets. The task of this note is to make clear the basic relationship between the flow called investment and the stock called capital. The firm’s acquisition of a capital asset, whether a small piece of machinery or a whole new plant and its equipment, is based on considerations quite different from those that underlie an individual’s purchase of consumer goods of any kind. The firm’s decision to purchase or not purchase in the case of capital goods requires a calculation of the rate of return expected from the asset over its life. The component of the Keynesian model of income determination is investment. Investment can be defined from several perspectives depending on the basis of the individual proffering the definition. To the economist for example, investment refers to the net capital formation, hence, it refers to such capital expenditure on consumer durables, residential constructions (buildings) and plants and machinery. Thus, investment from this perspective refers to the purchase of real tangible assets such as machines, factories or stocks of inventories which are used in the production of goods and services for future use as opposed to present consumption. From broader perspective however, investment can be viewed as the sacrifice of certain present values of consumption for (possibly uncertain) future value/consumption. It is the commitment of money in order to earn financial return of the purchase of financial assets such as stocks or bonds with future end date in mind (Anyanwu, 1995). In Keynesians terminology, investment refers to real investment which adds to capital equipment. It leads to increase in level of income and production by increasing the production and purchase of capital goods. Investment thus includes new plant and equipment, construction of public works like dams, roads, buildings, etc. net foreign investment, inventories, and stocks and shares of new companies (Jhingan, 2003). Capital on the other hand refers to real assets like factories, plants, equipment, and inventories of finished and semi-finished goods. It is any previously produced input that can be used in the production process to produce other goods. The amount of capital available in an economy is the stock of capital. Thus capital is a stock concept. To be more precise, investment is the production or acquisition of real capital assets during any period of time. Capital and investment are related to each other through net investment. Gross investment is the total amount spent on new capital assets in a year. But some capital stock wears out every year and is used up for depreciation and obsolesces. Net investment is gross investment minus depreciation and obsolescence. Net investment is gross investment minus depreciation and obsolesce charges (or replacement investment). gross investment equals depreciation, net investment is zero and there is no addition to the economy’s capital stock. If gross investment is less than depreciation, there is disinvestment in the economy and the capital stock decreases. Thus, for an increase in the real capital stock of the economy, gross investment must exceed depreciation i.e. there should be net investment. This refers to purchases by firms of newly produced capital goods such as production machinery, newly built structures, office equipment etc. Generally, investment is looked at as the acquisition of productive assets with a view of getting future profit, depending on time. If we assume a perfectly competitive market the inventor compares two things which are; firstly, the cost of employing capital and secondly, the marginal increase in employing additional capital compared to labour. If at any time the producer increases the employment of capital then there is a reduction in the employment of labour. Therefore, the marginal product of capital ratio will increase or rise. This is stocks of goods which have been produced by businesses but are yet unsold. Inventory investment refers to changes in stock of finished products and raw materials firms keep in their warehouse. These are meant to act as a safety cushion or buffer between production and sales. Firms avoid running out of stocks so as to avoid the risk of default in meeting customers’ orders, since this will expose them to risk of losing these customers to their competitors if they do. Rising stocks denote increases investor investment while a depletion of same results in decreasing stock. The third type refers to investment made to replace worn out capital goods resulting from their use in the production process. Replacement investment is also known as disposable investments. Another type of investment is investment in real estate and residential construction taken together, three types constitute an economy’s gross private domestic investment the subtraction of depreciation from the gross concept take us to the net investments. In discussing investment, emphasis usually is placed on firm’s expenditure on durable equipment and structures. This is the concepts of business fixed investment. In the Nigerian context, the concept of investment is not different from the definition given above. The Nigerian National Income Accounts define investment along the lines of gross private domestic investment or gross fixed capital formation (GFCF). The national account defines GFCF as consisting of all capital expenditures in building (residential and non-residential), land improvement, transport equipment, breeding stock and/or machinery and equipment (business fixed investment). The user cost of capital is obtained as the sum of the interest rate (implicit or explicit) paid on funds used in procuring investment goods and the depreciation, being the wear and tear of a piece of machinery resulting from usage. This calls for it periodic maintenance and repair for it to stay in good working order. The life span of a piece of machine is estimated and the annual depreciation rate is calculated from the estimate. Classical economists considered the rate of interest as the main determinant of investment spending. The reasoning is that firms compare the cost of funds spent on acquiring newly produced capital goods with the rate of return from the goods, assuming away uncertainties surrounding the return on investment. They proceed to carry out their decision to invest where the rate of return exceeds the cost of funds (implicit or explicit) obtained to finance the investment plan. In the light of this behaviour, it follows that a fall in the cost of fund as reflected in the interest rate will lead to an increase in investment. This microeconomic analysis of investment behaviour of a single profit maximising firm can be generalised to all firms such that it can be concluded that in the aggregate, investment is inversely related to the rate of interest. Unlike the classical economist however, Keynes opined that profit expectation from future economic activity on the part of businessmen was the most important determinant of investment behaviour. Businessmen optimism about future economic activity will prompt them to carry out their investment decision, the rate of interest notwithstanding. Conversely, a pessimistic business outlook will induce them to withhold their investment plans irrespective again of the interest rate. This probably explains why Keynes regards businessmen’s expectation as taking a prime position over the rate of interest in making investment decisions. machinery will be a function of the discrepancy between what the firm considers the optimal and the actual capital stock level Intuitively therefore, a firm with an excess capacity in plant size will engage in little or no new investment on plant and machinery. Corporate taxes also constitute a vital determinant of firms’ investment behaviour. Low corporate taxes and high corporate profits they imply permit firms to invest on capital goods. Conversely high corporate taxes and the implied low corporate profit serves to constrain the firms’ scope to carry out investment on newly produced capital goods. High corporate profit taxes translate to low retained earnings by firms and vice versa. The size of a firms retained earnings largely determines its scope to carry out investment decisions. innovation. Innovation brings about technical progress. Rapid technical progress gingers firms to invest more on capital goods than if the reverse were the case. This is because when technical progress is rapid, machines of older vintages go into obsolescence quickly. Firms find it imperative to invest in machines of newer vintages embodying the fruits of technical progress. The extent to which a change in the rate of interest causes a change in the rate of investment spending depends on the elasticity of the MEC schedule. The more elastic the schedule, the greater the increase or decrease in the profit-maximising capital stock that follows from any decrease or increase in the rate of interest. In order to specify the relationship between a change in the rate of interest and a change in the rate of investment spending, we must proceed from a change in the rate of interest through the resultant change in the profit-maximising capital stock to the resultant change in the rate of investment. Assuming again that a firm buys capital goods only in the expectation that each purchase will add to its profits, the elasticity of the MEC schedule for the economy as a whole may be said to depend on the significance of any given change in the interest rate as a factor altering the profit-maximising or desired capital stock for all firms combined. A fall in the interest rate may lead some firms to expand their stock of capital goods substantially, while the same fall in the interest rate may lead other firms to no expansion at all. The elasticity of the aggregate MEC schedule thus depends on the combined responses of all firms to any change in the interest rate. To investigate what determines whether any given change in the interest rate will lead to a larger or smaller change in the profit-maximising capital stock. Although it is immediately apparent that a lower interest rate, other things being equal, is also a reduction in one cost of doing business, we find that different businesses respond differently to such a drop. In seeking an explanation for this disparate reaction, we will get at the factors that determine the elasticity of the MEC schedule.With all other things assumed to remain unchanged, especially the existing state of technology, one factor that determines how great an increase in the profit-maximising capital stock will result from any given reduction in the interest rate is the extent to which firms find it technologically possible to substitute what is now the relatively more expensive labour input. It must be seen here that, in terms of the cost of factor units, the comparison is between the rate of interest as the cost of capital and wage rate as the cost of labour. Since we express the rate of return from or the productivity of an addition to the stock of capital as a percentage – namely, the MEC – we must for comparability express the cost of capital as another percentage – namely, the market rate of interest. A fall in the rate of interest is then a decrease in the cost of capital. In contrast, since we express the return from or the productivity of an addition of a unit of a given type of labour as the naira value of the output that will be produced because of that additional unit, the cost of labour is also expressed as a naira value, the naira cost of a unit of the given type of the labour. A fall in the wage rate paid labour is then a decrease in the cost of labour. With a fall in the interest rate and no change in the wage rate, there will be a tendency throughout the economy to substitute the cheaper input, capital, for the more expensive input, labour, in the production of any constant level of output. Although such a tendency will be present throughout the economy, the extent to which substitution of this sort actually takes place will vary widely from industry to industry and , to a lesser extent, from firm to firm. The role of finance in the investment decision has been drastically simplified by assuming that it involves only one element, the market rate of interest. Investment spending in any time period has been determined from the MEI schedule by drawing a horizontal line at the market rate of interest to an intersection with the MEI schedule. With a given MEI schedule, only a change in the rate of interest would produce a change in investment demand. Without denying the underlying correctness of this basic relationship, we must recognise the oversimplification that it involves. By showing that aggregate investment spending is determined by the intersection of the MEI curve with a horizontal line drawn at the prevailing rate of interest, we are assuming for one thing that funds are available in unlimited amounts to borrowers of every description at this one particular rate of interest that we called market rate of interest. A first objection to this is the fact that, in reality, there is no such thing as the market rate of interest. Rather there is a whole complex of rates. The rate paid by any particular borrower depends on such variables as the term of the loan, the size of the loan, the collateral offered, and especially the credit worthiness of the borrower. Beyond this, there is not an unlimited supply of funds available to any single borrower in any time period at this rate; there is some tendency for the rate he pays to rise with each addition to his indebtedness per time period, other things being equal. expressed as a percentage so that one is compared with the other. According to Keynes, the MEC is more volatile than the rate of interest. This is because the prospective yield of capital assets depends upon the business expectations. These business expectations are very uncertain. “They may change quickly and drastically in response to the general mood of the business community, rumors, news of technical developments, political events, even directors’ ulcers may cause a sudden rise or fall of the expected rate of yield. As a result, it is difficult to calculate the expected annual returns on the life of a capital asset. As Keynes himself wrote, “if we speak frankly we have to admit that our basis of knowledge for estimating the yield ten years hence of a railway, a copper mine, a textile factory, the goodwill of a patent medicine, an Atlantic liner, a building in the city of London amounts to little and sometimes nothing; or even five years hence”. Existing Stock Of Capital Goods. If the existing stock of capital goods is large, it would discourage potential investors from entering into the making of goods. Again, the induced investment will not take place if there is excess or idle capacity in the existing stock of capital assets. In case the existing stock of machines is working to its full capacity, an increase in the demand for capital goods manufactured by them will raise the demand for capital goods of this type and raise the inducement to invest. But it is the capital stock which influences the MEC. The MEC and the capital stock are inversely related. If the level of income rises in the economy through rise in money wage rates and other factors prices, the demand for goods will rise which will, in turn, raise the inducement to invest. Contrariwise, the inducement to investment will fall with the lowering of income levels. The present and future demand for the products greatly influences the level of investment in the economy. If the current demand for consumer goods is increasing rapidly, more investment will be made. Even if we take the future demand for the products, it will be considerably influenced by their current demand and both will influence the level of investment. Investment will be low if the demand is low, and vice versa. The amounts of liquid assets with the investors also influence the inducement to invest. If they possess large liquid assets, the inducement to invest is high. This is especially the case with those firms which keep large reserve funds and undistributed profits. On the contrary, the inducement to invest is low for investors having little liquid assets. Inventions and innovations tend to raise the inducement to invest. If inventions and technological improvements lead to more efficient methods of production which reduce costs, the MEC of new capital assets will rise. Higher MEC will induce firms to make larger investments in the new capital assets and in related ones. The absence of new technologies will mean low inducement to invest. An innovation also includes the opening of new areas. This requires the development of means of transport, the construction of housing etc, leading to new investment opportunities. Thus inducement to invest rises. A rapid growing population means a growing market for all types of goods in the economy. To meet the demand of an increasing population in all brackets, investmentwill increase in all types of consumer goods industries. On the other hand, a declining population results in a shrinking market for goods thereby lowering the inducement to invest. 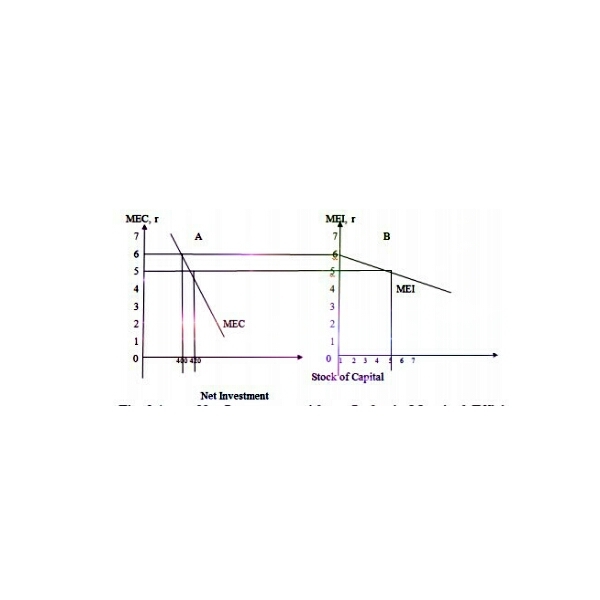 The meaning of capital and investment and with the mechanics of the relationship between the stock of capital and the rate of investment has been critically examined. If at any point in time the actual stock equals the profit maximising stock, an excess of the later over the former will appear subsequently only if the market rate of interest falls or if the marginal efficiency of capital schedules shifts upwards. Either change will give rise to a positive rate of net investment spending. Now that we understand the mechanics by which changes in the profit maximising capital stock are translated into changes in the rate of investment, we are free to concentrate on the factors whose changes produce shifts in or movements along the marginal efficiency of capital (MEC) schedule and thereby produce changes in the profits-maximising capital stock. The portion of aggregate demand that is accounted for by the business sector of the economy is measured by the investment expenditures of business for newly produced capital goods. To explain aggregate demand for anytime period, we must concentrate on business investment expenditures for that time period rather than on the actual stock of capital held by business at any point within that time period. Net investment expenditures for any time period are the means by which a change in the capital stock is affected. In other words, net investment, which is zero when actual capital stock equals the profit-maximising capital stock, becomes positive when the profit maximising exceeds the actual stock. A prerequisite to the appearance of net investment expenditures is a rise in the profit maximising capital stock. We have also examined the determinant of elasticity of the MEC schedule to include the extent to which firms find it technologically possible to substitute what is now the relatively more expensive labour input. We have looked at the role of finance beyond the rate of interest.